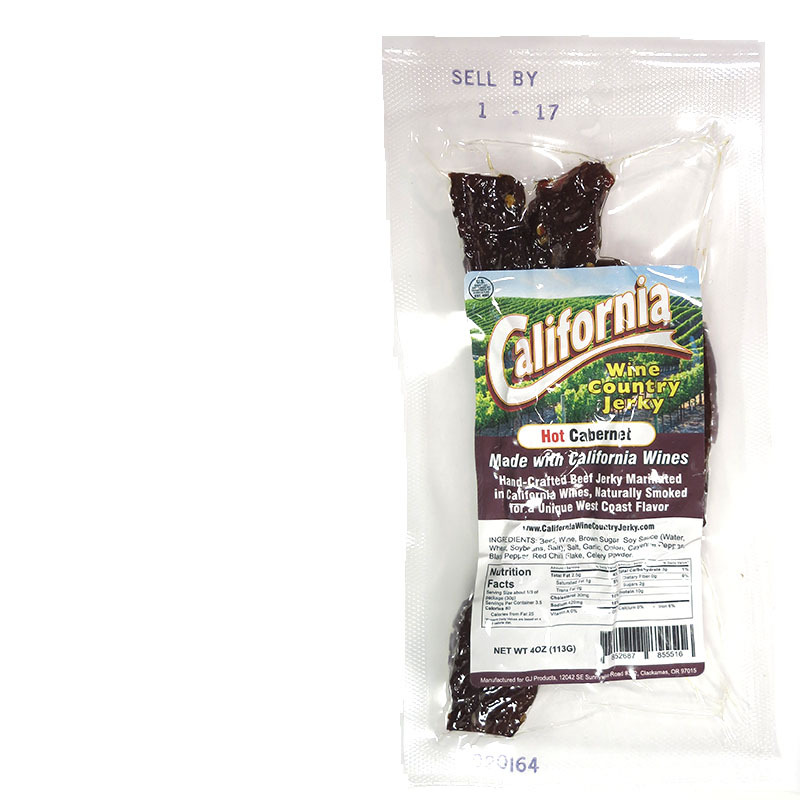 California Wine Country Jerky is a brand owned by GJ Products, based out of Clackamas, OR. It's run by Glenn Loehr who started it in 2015. 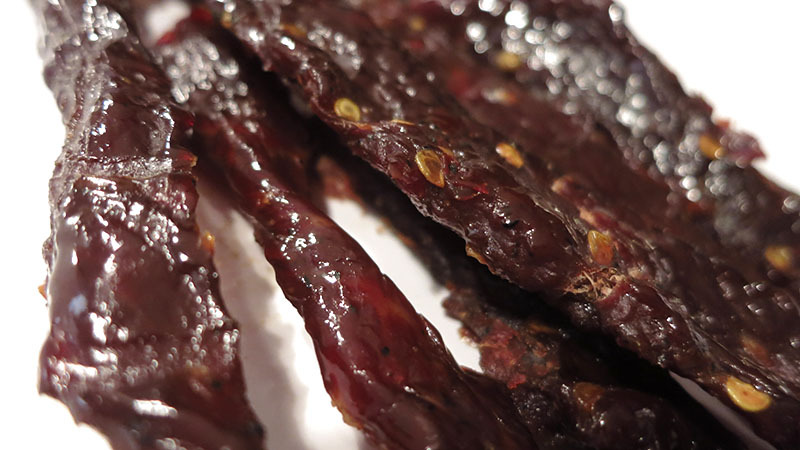 The company also owns, "Northwest Bierhaus Jerky", "Oregon Wine Country Jerky" and "Washington Wine Country Jerky". Together, these brands infuse the flavors of craft beer and wine from the Pacific Northwest, and target the tourist and gift basket markets. 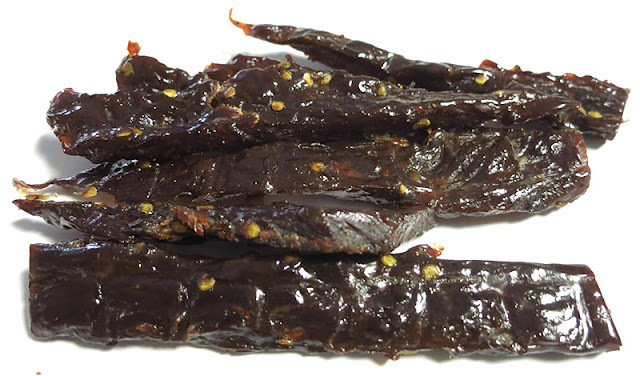 This, "Hot Cabernet Beef Jerky" is described by the company as combining, "the well structured wine with a hint of spiciness". The first flavors that hit my palate is a light sweet and salt, and touches of garlic and onion. The chewing brings on the flavor of wine-marinated beef, along with a bit more sweet, salt, garlic, and onion. There's a faint bit of heat in the background. For being marketed as, "Hot Cabernet", it has the flavor of red wine-marinated beef, but is not necessarily "hot". The spiciness is quite toned down, to what I would rate as "mild medium" on my personal heat scale (level 2 out of 5). And there's little cayenne or red chile pepper flavor. Otherwise, the primary taste profile is largely a garlic and onion seasoning, with a moderate sweet and salt, and the flavor of red wine-marinated beef. 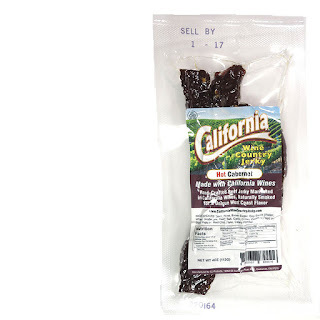 This Hot Cabernet Beef Jerky from California Wine Country does a good job of offering the unique flavor of wine-marinated beef. It has that dry, earthy red-wine marinade front and center and then flanked with simple seasonings. It's not at all "hot" as the name suggests, only lightly spicy, and otherwise tolerable for most sensitivities. After several bites of this jerky, the wine-marinated meat flavor tends to give way to the seasonings, and I can't seem to find that flavor anymore. Otherwise, it's still good chewing, and still overall a satisfying flavor.